Hello everyone, as I have promised recently I will write about my first impression of the E.L.F cosmetic brand. I have heard a lot of positive reviews of this brand in the past and recently I got the chance to try it out. I didn't have some high expectations I was just skeptic about the foundation color. Like I have said in post of the choice in February I have never used primer instead I've used creams and CC creams for priming my face but never actually the primer. I know that green primer are good for a skin redness so I have decided to try it. I'm pretty amazed with it I must admit it. I really wanted to try this eyebrow pencil with highlighter and all I can say, it's really easy to fill your eyebrow with it the color is warm brown. The most fear I had if this is the right color for my skin tone. I like that this foundation has SPF 15 especially for summer, even it would be good to use sun cream all year long. On the bottle you have suggestion to put foundation every 2 hours but I didn't have to one I put it on my face it stays there all day long. If you use silicon sponge I need it like one and half pump to cover all of my face. I must say I love this blush it gives your face such natural look and the peach color is perfect on my skin tone. I love that gives the natural and healthy look. Lately I have seen that these kinds of products are very popular so I wanted to give it a chance to see if I would like it. I was quite surprised with it. I must say I was impressed to see that all of my makeup came in these little boxes it gives more sophisticated look. Elisa P : I've wondered about the mist and set. I'm going to try it! Thanks for the review. Tara P : This is a brand that I need to check out. I really like the foundation. Marie A : I absolutely adore Elf! I have tried a year ago for the first time and it was such a nice surprise! cheap but so good! Julie E : Nice! For the Mist & Set, did it help your makeup last longer? Marcela I : Setting spray has help me that my makeup stays longer. Sometimes, I know to work 10 hours (one shift) during the high season and that means a lot, when I don't have to worry about my makeup. Alayna F : I'm going to have to try that primer. I go through primer SO FAST! Marcela I : That is my favorite primer. Now I use from Bell but, this from E.L.F in my opinion is better! I have had this for quite sometime, a little goes a long way! Tiffany H : I've never tried ELF products but I've heard nothing but good things. Perhaps it's time to give it a try. Lavanda M : I always hear good things about ELF. However, I never tried them before. I will have to look into getting some to try. 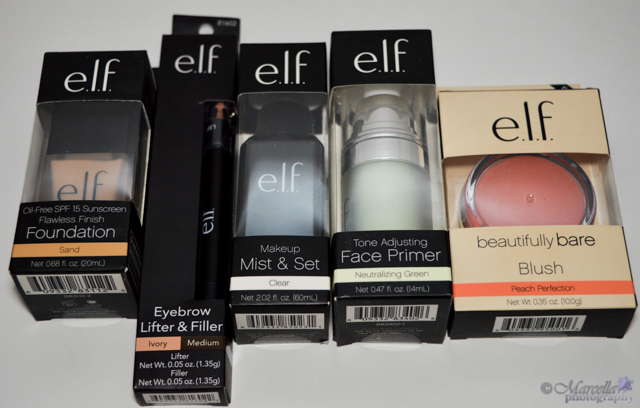 Cynthia N : I buy Elf products all the time. I really like their makeup and it is very affordable. Marcela I : Which is your favorite E.L.F product? Mei R : I think it's time for me to a facial makeover by using Elf products.